INTIMATE Research Brief 3 - Available! In March 2014 a new large international research project started at CES. 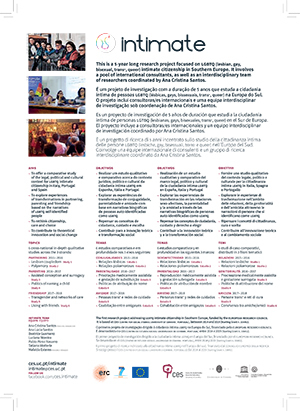 INTIMATE - Citizenship, Care and Choice: The micropolitics of intimacy in Southern Europe is a 5-year long project funded by the European Research Council and involves an interdisciplinary team of Italian, Spanish and Portuguese researchers coordinated by Ana Cristina Santos. Guided by the fundamental sociological question of how change takes place and, concomitantly, how law and social policy adjust to and/or shape the practices and expectations of individuals concerning personal life, this research will address intimacy from the perspective of those on the margins of social, legal and policy concerns in Southern Europe (Portugal, Spain, Italy) – lesbians, gay men, bisexuals and transgendered people. INTIMATE is based on 3 strands – Strand 1: the micropolitics of partnering; Strand 2: the micropolitics of parenting; and Strand 3: the micropolitics of friendship. This research involves conducting 6 cross-national qualitative studies across the strands of partnering, parenting and friendship in each of the chosen countries. The topics covered are lesbian coupledom, polyamorous relationships, assisted conception and surrogacy, naming a child, transgender and care, and living with friends in adult life. Expected results include a range of both international and national publications targeting academia and beyond, thematic conferences and participatory workshops, summer schools, internships, policy guidelines, media briefs and additional resources. Many of these outputs will be available for consultation on this website. The notion of intimacy is used in this research project as an overarching frame encompassing personal relationships and relational well-being, including conjugality, sexuality, parenthood, friendship and care. Therefore, partnering, parenting and friendship have been selected as analytical dimensions for the study of intimacy based on their significance in the construction of intimate biographies across a range of identities, backgrounds and geographic locations. Partnering, parenting and friendship constitute three different, although potentially interlinked, angles from which the idea of a ‘pure relationship’ (Giddens, 1992) that characterizes contemporary personal relationships can be tested. The notion of micropolitics enables a double focus on everyday practices and expectations (biographic dimension) within the wider contextual framework of law and social policy (socio-legal dimension).